Playa Ocotal Location and Climate. Playa Ocotal is located in the Gold Coast of Guanacaste. Playa Ocotal is known for 300+ days of sunshine per year. This makes buying real estate in Playa Ocotal a smart choice if you are looking to invest in costa rica real estate. The climate of Play Ocotal is ideal for a personal residence or a vacation rental home. Your ROI on investment properties in Playa Ocotal will be much higher than in other regions of Costa Rica. Found just a couple miles south of Playa del Coco, Ocotal is about a 45 minute drive from Liberia’s Daniel Oduber International Airport. Paved roads make an easy trip by car from the airport. 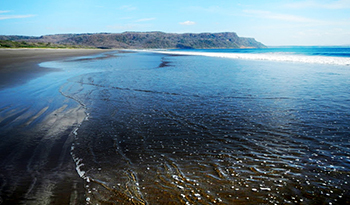 Like the rest of Guanacaste, Playa Ocotal generally has a warm and dry climate, featuring endless sunny days. September and October are the exceptions, during which time you can expect sunny mornings followed by scattered showers in the afternoons and/or evenings. Hurricanes and tropical storms do not exist in Costa Rica, so such large storms are never a threat. Temperatures will drop as far as into the high 60s during the green season and peak at the mid-90s during the warmest months of March and April. The closest beach to Playa Ocotal is Playas del Coco. Playas del Coco is the biggest beach town in the area with an active nightlife, plenty of restaurants, and resorts. Playas del Coco is easily accessible by foot or car. This makes Playa Ocotal a great place to get away from it all, but still be near good restaurants, bars, and crowds for those nights out on the town. Things to do in Playa Ocotal, Costa Rica.Playa Ocotal’s Location and Climate Real Estate in Playa Ocotal, Costa Rica: Peaceful Living Near Playas Del Coco. Real Estate Costa Rica Real Estate Krain Realty Krain Real Estate Krain Costa Rica Residency Costa Rica Residency and all the home search Flamingo and MLS you can handle. We are certain that you will find our information on residency in costa rica 2016-2020 to be very useful as well as our in depth knowledge of all things to do with the best international schools Guanacaste has to offer.